We at Sysgen RPO had a fruitful year that we are most grateful for. 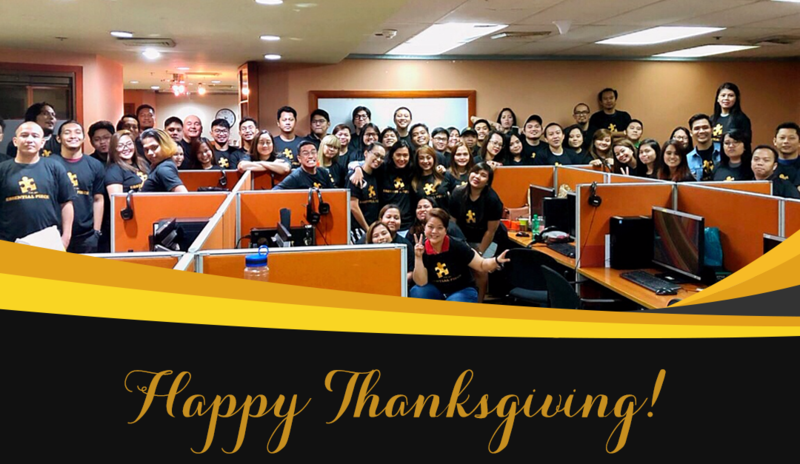 This year, we give thanks to the people who are doing their best to put Sysgen RPO among the top offshore RPO firms in the Philippines and to the continuing growth of our company. Our talented team continues to grow this year and is working towards giving our clients better and improved services. Of all the accomplishments we have gained this 2018, what stands out most is our successful appointment of the three critical leaders of our company. Maria Belen “Mia” Bayan-Bolinao, our new human resource manager, is responsible for the full range of HR functions, including employee relations, training and development, change, reward, and engagement among others. Dexter “Coby” Cristales, our new Learning and Organizational Development Manager, with his many years of experience in the RPO industry, is leading our team towards developing, implementing, and evaluating training solutions that will support the achievement of the organization’s strategic goals. Ezalyn “Eza” Caberto, our new Operations Manager, with her strong relationship with clients and years of experience in the industry, is responsible in managing the company’s overall operations, with a sharp focus on performance management, business growth, and employee development and retention. These are the people who are gearing our company towards a brighter future. With their guidance, every employee in Sysgen is sure to be efficient, and an asset to the company. We are happy to share that we have gained 15 new clients this year. They have entrusted us with their talent acquisition needs. Thank you for this trust and we will make sure to always aim to exceed your expectations. Our clients are always willing to give their full cooperation which is one of the reasons why we maintain a transparent and harmonious working relationship. Whatever recruitment hurdles we meet, we can continue to prosper as long as we work side by side. To our dedicated and hardworking team, know that you are still the core of our success, and your drive and passion are what keeps us going. To our clients, may our bond grow stronger as we face mutual challenges and reach milestones after milestones.